The Rachel Berry Halloween Dress! Well, I finished it in time for the Halloween party on Saturday night, with actually an hour to spare to get dressed and ready. I didn’t start it until Friday night (thanks to a Skype date with my attractive Polish manfriend. But I’m not complaing), when I cut out all the pieces and then sewed up the bodice and the bodice lining. Oh, and the skirt seam. Saturday was spent sewing the bodice and lining together, gathering and sewing on the skirt, putting in the zipper, finishing the armholes, and hemming. Oh, and I even had time to squeeze a nap in there! Oh, and I even made an “I love Finn” badge for the party so that people would get that I was Rachel Berry. Well, technically, I googled “I love Finn badge” and luckily one popped up that was perfect. But, I did print it out and pin it to my cardigan! As for the skirt: Holy Hannah, I’m not used to them being this short! Okay, it doesn't look that short in this photo because my knees are bent, but it really is short! It is amazing how effortlessly your personality flows over to your blog posts. I could very easily see you saying “holy hannah” and “that skirt is too short”, pointing out your handicap as far as yardage goes or admitting that it was not, in fact, you who made the “I heart Finn” badge. As far as the dress goes, I was completely lost in that first paragraph (with the exception of one flattering sentence) about the sewing terminology. You wear it well, but I think the costume looks better than what you wore the next day. 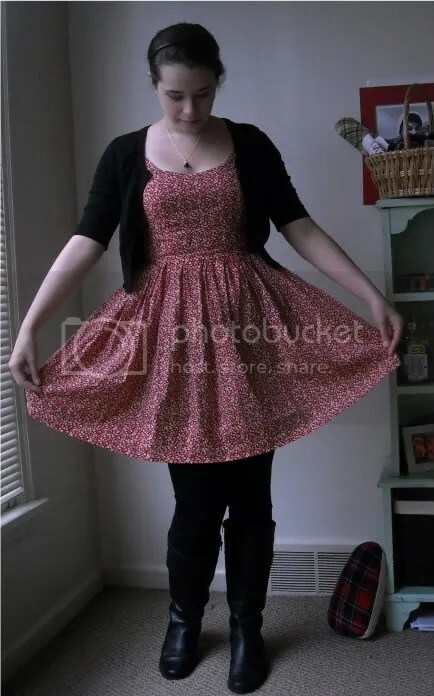 If you’re concerned about length of the skirt, the boots (which run up pretty high) and the shorter cardigan gives the illusion that the skirt is shorter, so for that reason as well, stick with the flats. However, the edges near the neck of the second day’s cardigan have sharper edges, which give you a more flattering neckline. All and all, you’re pretty talented, and would have made a wonderful seamstress with cats, if that were the life you chose for yourself. And for a boy (albeit, an incredibly attractive one), you actually have some good style advice there. The only thing about the boots is they are a bit warmer (when combined with leggings) than wearing tights and flats with this dress. Then again, I probably shouldn’t be wearing a dress this short when it’s starting to get really cold outside like it is now . . .